London: Hutchinson. 86th thousand. 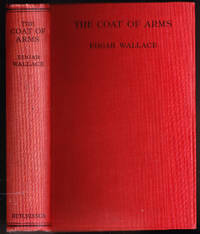 Undated 1930's (1st edition was 1931). Ex-library copy, plates in front and neat stamps inside . Good. Hardcover. reprint. GB: Pan/Ballantine, 1973. Book is in near very good condition with minor but just noticeable signs of wear and/or age. . 1st Thus. Paperback. nrVG. England: Hutchinson, 1950. Book. Good. Hardcover. 12mo - over 6¾" - 7¾" tall. Owner initials to prelims, old price to front cover. Where possible small books will have postage reduced. London: Hutchinson . Red cloth, titled gilt on spine. Spine a touch dulled . Very Good. Hardcover. reprint. 1950. GB: Arrow, 1957. 448H. . Reprint. Paperback. VG+. House of Stratus Ltd. Used - Good. Ships from the UK. Former Library book. Shows some signs of wear, and may have some markings on the inside. 100% Money Back Guarantee. Your purchase also supports literacy charities.